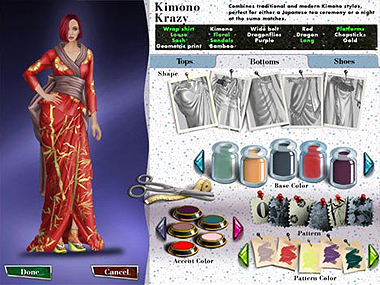 Create trendsetting fashions with thousands of combinations! Jojo is back in the smash hit Time Management fashion game series and this time with an exciting World Tour! 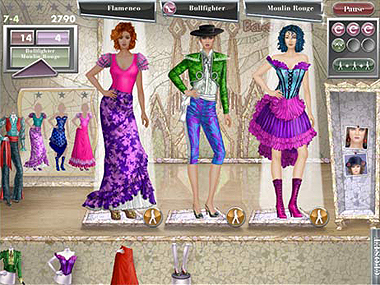 In Jojo’s Fashion Show World Tour, Jojo has come out of retirement at the request of her daughter Rosalind and revived her career as a world famous fashion designer. Now it’s time for Rosalind to pursue her own dreams though, leaving Jojo to find a suitable replacement for an assistant, which… doesn’t prove to be an easy task! After interviewing some impossible candidates, she finally hires a young woman named Haley. However, drama is never far away, especially when it becomes apparent that Haley is intent on destroying Jojo’s career and stealing Rosalind’s boyfriend! The question is… can Jojo save the Las Cruces fashion label AND her daughter’s relationship? Jojo’s Fashion Show World Tour is a nice twist from the usual Time Management games and will appeal to all designers at heart. The game unfolds as you join Jojo in 10 different location including, Tokyo, Barcelona, Amsterdam, London and Rio de Janeiro to show her latest collections. At each location you have 10 different runway shows with three models (mostly female but occasionally male), each with a certain style listed above their heads. Your job is to mix and match outfits to meet the demands of the various styles like, Sultry Flamenco, Sleek Paris Street, Bold Betawi and Gothic Loli. Once the models are dressed and ready to go you send them out on the runway, where your outfit will be scored to see whether you are a top designer! The main purpose is to collect as many points for each outfit and create a five star show (although you can pass the level with only three stars). The gameplay seems rather simple but becoming a master and scoring top points can be rather challenging! For starters you are timed, so going too slow means sending a model on to the runway with only her underwear on… imagine the horror! Luckily there are a few power-ups you can use to make your job easier; the supermodel power-up adds points to your outfit, the dazzle power-up buys you more time and the shuffle power-up gets you a completely new rack of clothing. And, should you be lost for inspiration, you can always match your outfit to the pre-existing catalogue and score extra points or decide to swap the entire style and start afresh. 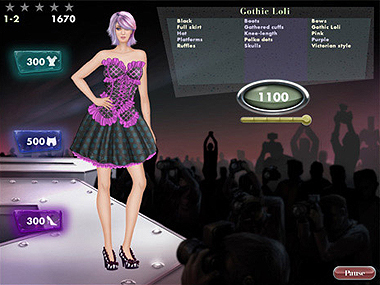 Another cool add-on to the game is the chance to create brand new outfits from scratch (this includes choosing the style, color and fabric patterns of the outfit) and send your models on the Runway with your unique design to see how well it scores. Jojo’s Fashion Show World Tour is a great spin on the box standard Time Management games. With cool visuals, exciting atmosphere and funky music that includes applause from the crowd, this really does feel like a real fashion show and is a must for every fashion lover! 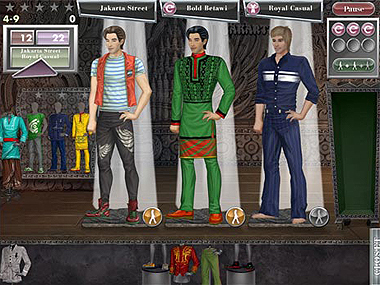 Download and play Jojo’s Fashion Show World Tour for FREE! I love Jojo games!!!! !They’re so cool! I love these type of games and my grand-daughter loves these even more. She is seven years old going on 30. Wonderful and sooooo amusing to give ideas for your wardrobe. I love this game, can,t wait till they come out with jojo,s fashion show 4. I love this game, and be glad when they come out with jojo,s fashion show 4. The people who do this are eetihr paid video game reviews or very popular free lance game reviewers.Considering you asking this i’m assuming you would need to be a free lance to get the games.You will need to draw attention to your self as a game reviewer, although this won’t be easy.I recommend posting game reviews were people will care to look or watch them.Jake.